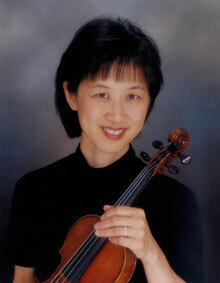 June Huang, violinist, holds a Masters of Music degree from the University of California and a Bachelors of Music degree from Oberlin Conservatory. She attended the Cincinnati College-Conservatory of Music as an undergraduate. An active freelancer in the Washington, D.C. area, she performs frequently at the Kennedy Center, the Music Center at Strathmore, and the Washington National Cathedral. Ms. Huang is a critically acclaimed baroque violinist. She has performed and recorded with Opera Lafayette, Folgers Consort, Four Nations, Washington Bach Consort, and Bach Sinfonia. She is concertmaster of the Washington National Cathedral Baroque Orchestra. Highlights of this season included recording and performing with Opera Lafayette on their tour to New York City and Versailles, France. An active chamber musician, Ms. Huang has appeared on the concerts series of the Chamber Music Society of Central Virginia, Staunton Music Festival, and Virginia Virtuosi. She is in frequent demand as a Suzuki guest clinician and is on the faculty of the Blue Ridge Suzuki Camp. She is Founder and Director of String Camp and Strings Plus at Levine Music in Washington D.C. Ms. Huang is a former member of the Cascade String Quartet.